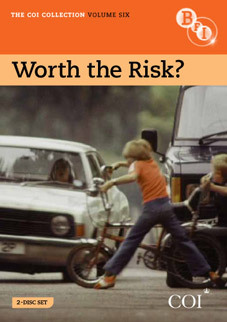 The BFI's fascinating film collections from Britain's Central Office of Information (you can read Jerry Whyte's extensive review of Volume Five here) continue in November with a volume that examines the issue of ‘risk' in our everyday lives. It features almost 50 films, from the 1940s to 2000, all peppered with the COI's characteristic mix of horror, humour, famous faces and gentle persuasion. Complimenting the safety messages in the earlier Volume Four, Stop! Look! Listen!, the films on Worth the Risk? offer advice on crossing the road, sensible drinking, playing with matches, the Welfare State, the complexities of decimalisation, surviving nuclear attack... and much, much more. Among the many highlights are: Skateboard Safety (1978), play safe ‘you mad skateboard dogs'; Charley's March of Time (1948), pioneering animation explains the workings of the new Welfare State; Green Cross Code (1973), David Prowse is on hand to admonish and advise; Hole in the Ground (1962), an unnerving civil defence film from the Cold War era; Say No to Strangers (1981), Bernard Hill, Brenda Blethyn and Timothy Spall star in this creepy and uncompromising film; Laughing Matter (circa late 1970s), Robbie Coltrane's stand-up routine isn't funny; Passing Places (1973), a bluegrass style road safety song from a young Bill Patterson and Peach and Hammer – Carol Hill (1973), the unforgettable road safety film by director John Krish. The COI Collection: Volume Six – Worth the Risk? will be released on UK DVD by the BFI on 7th November 2011 at the RRP of £19.99. Illustrated booklet with notes and essays from film historians and filmmakers.